Die Jovis, 23° Februarii 1832. Lewis v. Colmer et al. Licensed Victuallers, Petition from New Windsor respecting Liability of. Reform of Parliament, Petition from Derrypatrick in favor of. National Trades Political Union, Dublin. 10th Report of Inspectors General of Prisons. Ministers, (Ireland,) Petition of the National Trades Political Union, Dublin, respecting, & for Repeal of Vestry Acts. 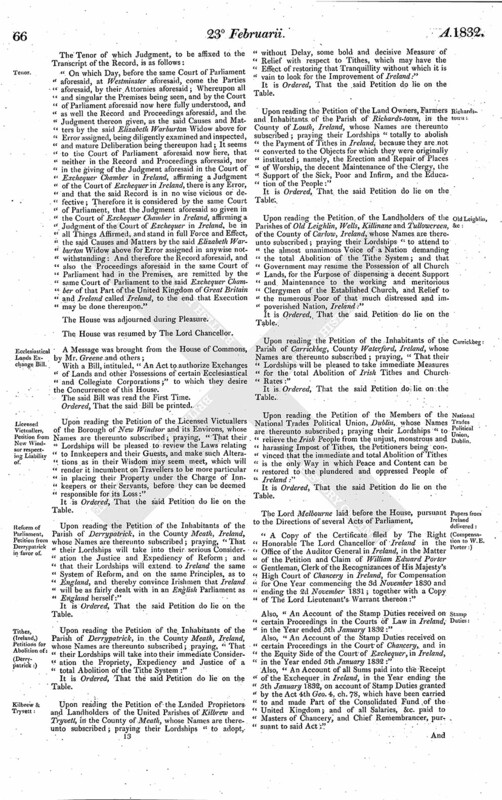 Reform of Parliament, Petition from Cambridge against proposed Measure of. Antrobus's et al. Petition referred to Judges. Nicol v. Sir R. W. Vaughan et al. Respondents Petition to lodge their Case, referred to Appeal Com ee. Ld. Douglas's Petition referred to Judges in Scotland. Court of Exchequer Officers Bill presented. All Lords added to the Com ee. Proceedings on East India Judicature Act. The Answer of Edward Earl Digby to the Petition and Appeal of Henry Howard Esquire was this Day brought in. As was also, The separate Answer of Thomas Sampson to the Petition and Appeal of James Lewis. Accordingly, The Lord Chief Justice of the Court of Common Pleas delivered the unanimous Opinion of the Judges present upon the said Questions, That the registered Deed of 1800 is to be preferred to the unregistered Deed of 1779; and gave his Reasons. It is Ordered, and Adjudged, by the Lords Spiritual and Temporal in Parliament assembled, That the said Judgment given in the Court of Exchequer Chamber in Ireland, affirming a Judgment of the Court of Exchequer in Ireland, be, and the same is hereby Affirmed; and that the Record be remitted, to the end such Proceeding may be had thereupon as if no such Writ of Error had been brought into this House. "On which Day, before the same Court of Parliament aforesaid, at Westminster aforesaid, come the Parties aforesaid, by their Attornies aforesaid; Whereupon all and singular the Premises being seen, and by the Court of Parliament aforesaid now here fully understood, and as well the Record and Proceedings aforesaid, and the Judgment thereon given, as the said Causes and Matters by the said Elizabeth Warburton Widow above for Error assigned, being diligently examined and inspected, and mature Deliberation being thereupon had; It seems to the Court of Parliament aforesaid now here, that neither in the Record and Proceedings aforesaid, nor in the giving of the Judgment aforesaid in the Court of Exchequer Chamber in Ireland, affirming a Judgment of the Court of Exchequer in Ireland, there is any Error, and that the said Record is in no wise vicious or defective; Therefore it is considered by the same Court of Parliament, that the Judgment aforesaid so given in the Court of Exchequer Chamber in Ireland, affirming a Judgment of the Court of Exchequer in Ireland, be in all Things Affirmed, and stand in full Force and Effect, the said Causes and Matters by the said Elizabeth Warburton Widow above for Error assigned in anywise notwithstanding: And therefore the Record aforesaid, and also the Proceedings aforesaid in the same Court of Parliament had in the Premises, are remitted by the same Court of Parliament to the said Exchequer Chamber of that Part of the United Kingdom of Great Britain and Ireland called Ireland, to the end that Execution may be done thereupon." With a Bill, intituled, "An Act to authorize Exchanges of Lands and other Possessions of certain Ecclesiastical and Collegiate Corporations;" to which they desire the Concurrence of this House. Upon reading the Petition of the Licensed Victuallers of the Borough of New Windsor and its Environs, whose Names are thereunto subscribed; praying, "That their Lordships will be pleased to review the Laws relating to Innkeepers and their Guests, and make such Alterations as in their Wisdom may seem meet, which will render it incumbent on Travellers to be more particular in placing their Property under the Charge of Innkeepers or their Servants, before they can be deemed responsible for its Loss:"
Upon reading the Petition of the Inhabitants of the Parish of Derrypatrick, in the County Meath, Ireland, whose Names are thereunto subscribed; praying, "That their Lordships will take into their serious Consideration the Justice and Expediency of Reform; and that their Lordships will extend to Ireland the same System of Reform, and on the same Principles, as to England, and thereby convince Irishmen that Ireland will be as fairly dealt with in an English Parliament as England herself:"
Upon reading the Petition of the Inhabitants of the Parish of Derrypatrick, in the County Meath, Ireland, whose Names are thereunto subscribed; praying, "That their Lordships will take into their immediate Consideration the Propriety, Expediency and Justice of a total Abolition of the Tithe System:"
Upon reading the Petition of the Landed Proprietors and Landholders of the United Parishes of Kilbrew and Tryvett, in the County of Meath, whose Names are thereunto subscribed; praying their Lordships "to adopt, without Delay, some bold and decisive Measure of Relief with respect to Tithes, which may have the Effect of restoring that Tranquillity without which it is vain to look for the Improvement of Ireland:"
Upon reading the Petition of the Land Owners, Farmers and Inhabitants of the Parish of Richards-town, in the County of Louth, Ireland, whose Names are thereunto subscribed; praying their Lordships "totally to abolish the Payment of Tithes in Ireland, because they are not converted to the Objects for which they were originally instituted; namely, the Erection and Repair of Places of Worship, the decent Maintenance of the Clergy, the Support of the Sick, Poor and Infirm, and the Education of the People:"
Upon reading the Petition of the Landholders of the Parishes of Old Leighlin, Wells, Killinane and Tullowcreen, of the County of Carlow, Ireland, whose Names are thereunto subscribed; praying their Lordships "to attend to the almost unanimous Voice of a Nation demanding the total Abolition of the Tithe System; and that Government may resume the Possession of all Church Lands, for the Purpose of dispensing a decent Support and Maintenance to the working and meritorious Clergymen of the Established Church, and Relief to the numerous Poor of that much distressed and impoverished Nation, Ireland:"
Upon reading the Petition of the Inhabitants of the Parish of Carrickbeg, County Waterford, Ireland, whose Names are thereunto subscribed; praying, "That their Lordships will be pleased to take immediate Measures for the total Abolition of Irish Tithes and Church Rates:"
Upon reading the Petition of the Members of the National Trades Political Union, Dublin, whose Names are thereunto subscribed; praying their Lordships "to relieve the Irish People from the unjust, monstrous and harassing Impost of Tithes, the Petitioners being convinced that the immediate and total Abolition of Tithes is the only Way in which Peace and Content can be restored to the plundered and oppressed People of Ireland:"
"A Copy of the Certificate filed by The Right Honorable The Lord Chancellor of Ireland in the Office of the Auditor General in Ireland, in the Matter of the Petition and Claim of William Edward Porter Gentleman, Clerk of the Recognizances of His Majesty's High Court of Chancery in Ireland, for Compensation for One Year commencing the 3d November 1830 and ending the 2d November 1831; together with a Copy of The Lord Lieutenant's Warrant thereon:"
Also, "An Account of the Stamp Duties received on certain Proceedings in the Courts of Law in Ireland, in the Year ended 5th January 1832:"
Also, "An Account of the Stamp Duties received on certain Proceedings in the Court of Chancery, and in the Equity Side of the Court of Exchequer, in Ireland, in the Year ended 5th January 1832:"
Also, "An Account of all Sums paid into the Receipt of the Exchequer in Ireland, in the Year ending the 5th January 1832, on account of Stamp Duties granted by the Act 4th Geo. 4. ch. 78, which have been carried to and made Part of the Consolidated Fund of the United Kingdom; and of all Salaries, &c. paid to Masters of Chancery, and Chief Remembrancer, pursuant to said Act:"
And also, "The Tenth Report of the Inspectors General of Prisons in Ireland, for the Year 1831." 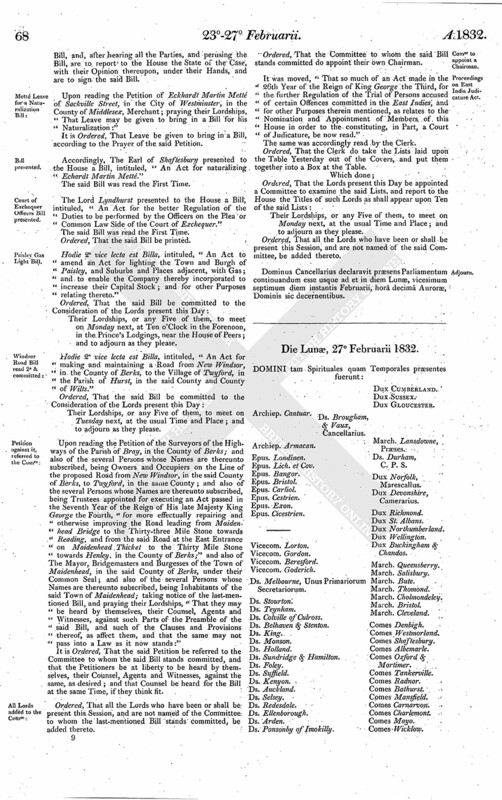 Upon reading the Petition of the Members of the National Trades Political Union of Dublin, whose Names are thereunto subscribed; praying their Lordships "to repeal so much of the Act of the Irish Legislature of the 17th and 18th Charles 2d, for Provision of Ministers in Corporate Towns, as orders the Levy and Payment of Twelve-pence in the Pound of the Yearly Value of Houses in Cities and Corporate Towns in Ireland, for the Use of the respective Incumbents of the said Cities and Towns Corporate; and also to repeal the several other Vestry Acts in force in Ireland; or adopt such other Measures for the Relief of the Petitioners, as to their Lordships shall seem meet:"
Upon reading the Petition of the Students of Medicine in the University of Glasgow, and in the other Medical Schools of that City, whose Names are thereunto subscribed; praying their Lordships, "That, as the only Mode of procuring an adequate Supply to Schools of Anatomy of Subjects for Dissection, so that their Price may be no Temptation to those Crimes which have so lately shocked our Feelings and disgraced our Country, they will give for Dissection the Bodies of those who die in Hospitals, Workhouses, Prisons, &c. unclaimed, and who would be buried at the Public Expence, in addition to those who will voluntarily bequeath their Bodies; and that their Lordships will give their Permission to the free Importation of Subjects, so as to form a Supply should the Hospitals, &c. prove insufficient:"
Upon reading the Petition of Denis Phelan M. R. C. S. London, Thomas Scully M.D.-M. R. C. S. Edinburgh, John Sweeney M. R. C. S. London, and M. S. Quinlaw, M. R. C. S. London; praying their Lordships, "That it may be made imperative on, or at least permissive for, the Medical Attendants of any Hospital or Workhouse in the Country, in which the Sick and Paupers receive professional Attendance and Support at the Public Expence, (not including Fever Hospitals,) to make a post mortem Examination of every Person dying in such Institution of any obscure or intractable Disease, and to report the same to the Governors; also that it may be made permissive for the Governors or other Managers of Hospitals and Workhouses (not including Fever Hospitals) to give up the Bodies of Paupers dying therein, and not claimed by any Relative for the Purpose of Burial within Thirty-six Hours, to professional Men properly qualified to receive such Bodies for the Purpose of Dissection; also that any Bill to prevent the exhuming of dead Bodies, intended to be passed for Great Britain, may be extended to Ireland; and that it may be made a Provision of any Bill that their Lordships may pass, that all regularly-qualified Physicians and Surgeons residing in any of the Cities or Towns in which such legalized post mortem Examinations or Dissections may take place shall have a legal Right to be present at the same:"
Upon reading the Petition of the Inhabitants of the Borough of Lancaster, in the County of Lancaster, whose Names are thereunto subscribed; praying their Lordships, "That the Dissection of dead Bodies in the Schools of Anatomy may be placed under the immediate Surveillance of the Magistrates and Police; and that a Bill to repeal the existing Laws for the Dissection of Murderers, and to allow dead Bodies to be given or received for Dissection, and for permitting all dead Bodies unclaimed by the Relatives of the Deceased to be claimed by and given up to the Surgeons for that Purpose, may be introduced into and passed this House:"
Upon reading the Petition of the Freeholders and others, Owners and Occupiers of Land in the County of Cambridge and Isle of Ely, whose Names are thereunto subscribed; praying, "That their Lordships, uninfluenced by popular Clamour, will give their Sanction to the proposed Measure for amending the Representation of the People, in the Event only of its being ultimately rendered in their Lordships Judgment reconcileable with the Maintenance of those established Institutions which (by the Blessing of Providence) have hitherto secured to this Country a greater Measure of Liberty and Prosperity than has ever been enjoyed by any other Nation:"
Upon reading the Petition of the Glove Manufacturers of the City of Worcester, whose Names are thereunto subscribed; praying, "That their Lordships will adopt, with all convenient Dispatch, that prohibitory System against the Importation of Foreign Gloves under which the Petitioners Trade flourished, and to which alone they confidently look forward as the Means of restoring it to its former Prosperity:"
Upon reading the Petition of Sir Robert Williams Vaughan Baronet, and others, Respondents in a Cause depending in this House, to which William Nicol is Appellant; praying their Lordships, "That the Petitioners may now be at liberty to lodge their Cases:"
It is Ordered, That the Consideration of the said Petition be, and is hereby referred to Lord Glenlee, in Scotland, and Lord Newton, in Scotland, or in their Absence, or the Absence of either of them, to Lord Balgray, in Scotland, and Lord Corehouse, in Scotland; and that the said Judges, or any Two of them, are forthwith to summon all Parties before them who may be concerned in the Bill, and, after hearing all the Parties, and perusing the Bill, are to report to the House the State of the Case, with their Opinion thereupon, under their Hands, and are to sign the said Bill. Upon reading the Petition of Eckhardt Martin Mette of Sackville Street, in the City of Westminster, in the County of Middlesex, Merchant; praying their Lordships, "That Leave may be given to bring in a Bill for his Naturalization:"
Accordingly, The Earl of Shaftesbury presented to the House a Bill, intituled, "An Act for naturalizing Echardt Martin Mette." The Lord Lyndhurst presented to the House a Bill, intituled, "An Act for the better Regulation of the Duties to be performed by the Officers on the Plea or Common Law Side of the Court of Exchequer." Hodie 2a vice lecta est Billa, intituled, "An Act to amend an Act for lighting the Town and Burgh of Paisley, and Suburbs and Places adjacent, with Gas; and to enable the Company thereby incorporated to increase their Capital Stock; and for other Purposes relating thereto." Hodie 2a vice lecta est Billa, intituled, "An Act for making and maintaining a Road from New Windsor, in the County of Berks, to the Village of Twyford, in the Parish of Hurst, in the said County and County of Wilts." Their Lordships, or any Five of them, to meet on Tuesday next, at the usual Time and Place; and to adjourn as they please. 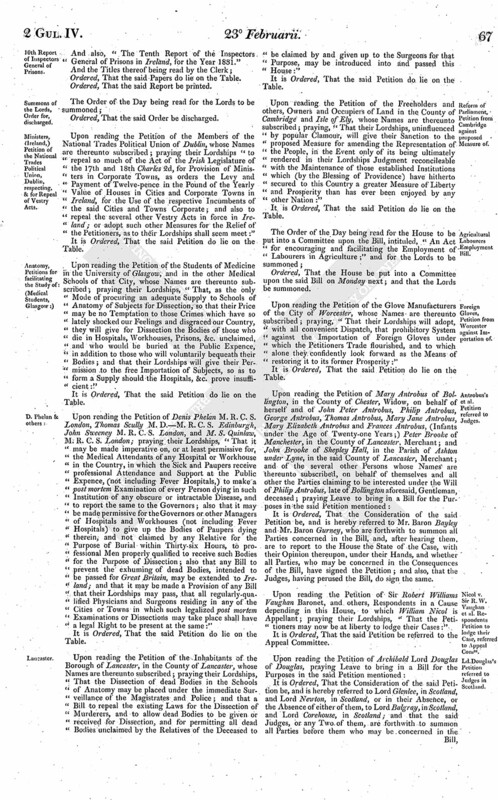 Upon reading the Petition of the Surveyors of the Highways of the Parish of Bray, in the County of Berks; and also of the several Persons whose Names are thereunto subscribed, being Owners and Occupiers on the Line of the proposed Road from New Windsor, in the said County of Berks, to Twyford, in the same County; and also of the several Persons whose Names are thereunto subscribed, being Trustees appointed for executing an Act passed in the Seventh Year of the Reign of His late Majesty King George the Fourth, "for more effectually repairing and otherwise improving the Road leading from Maiden head Bridge to the Thirty-three Mile Stone towards Reading, and from the said Road at the East Entrance on Maidenhead Thicket to the Thirty Mile Stone towards Henley, in the County of Berks;" and also of The Mayor, Bridgemasters and Burgesses of the Town of Maidenhead, in the said County of Berks, under their Common Seal; and also of the several Persons whose Names are thereunto subscribed, being Inhabitants of the said Town of Maidenhead; taking notice of the last-mentioned Bill, and praying their Lordships, "That they may be heard by themselves, their Counsel, Agents and Witnesses, against such Parts of the Preamble of the said Bill, and such of the Clauses and Provisions thereof, as affect them, and that the same may not pass into a Law as it now stands:"
It is Ordered, That the said Petition be referred to the Committee to whom the said Bill stands committed, and that the Petitioners be at liberty to be heard by themselves, their Counsel, Agents and Witnesses, against the same, as desired; and that Counsel be heard for the Bill at the same Time, if they think fit. 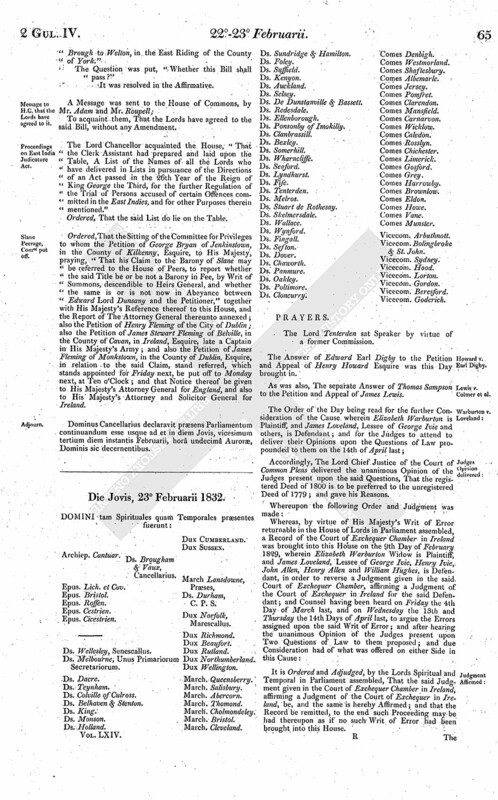 It was moved, "That so much of an Act made in the 26th Year of the Reign of King George the Third, for the further Regulation of the Trial of Persons accused of certain Offences committed in the East Indies, and for other Purposes therein mentioned, as relates to the Nomination and Appointment of Members of this House in order to the constituting, in Part, a Court of Judicature, be now read." Ordered, That the Clerk do take the Lists laid upon the Table Yesterday out of the Covers, and put them together into a Box at the Table. Ordered, That all the Lords who have been or shall be present this Session, and are not named of the said Committee, be added thereto. Dominus Cancellarius declaravit præsens Parliamentum continuandum esse usque ad et in diem Lunæ, vicesimum septimum diem instantis Februarii, horâ decimâ Auroræ Dominis sic decernentibus.